The Phoenix Suns are just 9-20 and have lost its past four contests. It has lost eight of its last 10 overall and is currently five-games behind No. 8 Utah in the Western Conference standings. The Suns are 5-11 at home where it will host the Eastern Conference’s No. 3 team, the Toronto Raptors. Toronto has won seven of its past 10 overall, to arrive at a 17-8 mark on the young season. The Raptors are 12-point favorites in tonight’s matchup with an over-under set at 221 points according to NBA oddsmakers at bookmaker 5dimes. Toronto had knocked off its past six opponents prior to its last outing, a 96-91 loss to the Los Angeles Clippers, and it boasts the league’s third-highest scoring average behind only Houston and Golden State. The team is also strong with a top-10 defense that allows only 103.2 points per game. The Raptors are quietly contending, and probably the reason for the silence about the team’s play has been the fact that point guard Kyle Lowry and shooting guard DeMar DeRozan are continual playoff disappointments. Perhaps what few are considering is that label could be shed on any given year, and the way Toronto is playing, some might be inclined to say this is, in fact, that year. DeRozan has thrived as the team’s primary scorer despite not being much of a three-point threat. DeRozan averages 23.2 points per game and gets it done in the mid-range while also slashing to the hole plenty. Lowry is putting together another well-rounded statistical year with 16.4 points, 6.4 rebounds and 7.0 assists per game. Lowry is only managing 0.92 steals per game, which is anomalous for him, but he is gambling less and playing solid man-to-man defense. Serge Ibaka has declined considerably as a defender and rim protector, but he is still a serviceable power forward and upgrade over the likes of Patrick Patterson. Veteran swingman CJ Miles and center Jonas Valanciunas are both having respectable seasons, while the Raptors also boast plenty of depth with an assortment of talented youngsters like Norman Powell, Delon Wright, Jakob Poeltl, Pascal Siakem and OG Anunoby. All play 16 minutes or more per game while averaging no less than seven points a night. 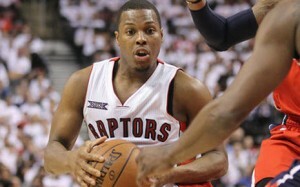 The Raptors have defense and depth at all positions and a high scoring offense. Not much is going right for the Phoenix Suns, though, Phoenix is giving up a league-worst 114.4 points per game to opponents, while managing to score a respectable 106.6 points. Scoring has not been the problem, but rather a porous defense that likely only got worse when the Suns recently dealt Eric Bledsoe for a weak-defending big in Greg Monroe. The Suns have a glut in the frontcourt, but none of those talents are really thriving. Alex Len is still wildly inconsistent, and Tyson Chandler is quickly declining. There are few reasons to expect Phoenix to turn it around, without several talents simply emerging mid-season, which happens close to never. While the Suns have a few disappointments on the roster, its top two players have been anything but. Devin Booker and T.J. Warren are both having fine seasons on an abysmal team. Booker is averaging 24.3 points, 4.5 rebounds, and 4.1 assists while posting a PER of 19.5. Warren has stepped up even more and is in contention for the league’s Most Improved Player award. The swingman is averaging 18.7 points and 5.7 rebounds per game, and he is looking like a very viable future “three and D” swingman for Phoenix. Even 27-year-old rookie Mike James has been steady and good, but Phoenix has a lot of players attempting to prove themselves without much a team focus on defense. Lottery pick Josh Jackson has been slow in coming along, but he is averaging 9.2 points and 3.6 rebounds in 22 minutes a night. He is supposed to evolve into a premier scorer, but there has been scarcely an indication that is happening soon. Second-year forward Marquese Chriss is perhaps one of the biggest disappointments, after making the All-Rookie first team a year ago. While he is attempting threes now, he is not connecting at an outstanding rate (just 31 percent) and his athleticism has not really translated into much more than occasional garbage buckets at the rim. Chriss is averaging just six points per game in his second season, while Phoenix ideally expected about twice that production from him given the strong start to his career a season ago. With so many supposedly underachieving players, the best Phoenix offers is a chance to watch one of the game’s top young 2-guards in Booker.